Windsor, SC – January 25, 2013 – The Third Annual Salute to Driving fundraising event is pleased to announce that it will once again be held in Windsor, SC, March 1-3, 2013. Each year, this event benefits the country’s High Performance Driving programs for the United States Equestrian Team Foundation. The exciting weekend will feature a beautiful dinner and auction on Saturday evening, multiple driving clinics with some of the world’s top trainers, and a Combined Test Competition for any drivers Preliminary-Advanced on Sunday. The Salute to Driving event is being held to help raise awareness and educate different audiences about the discipline of driving. 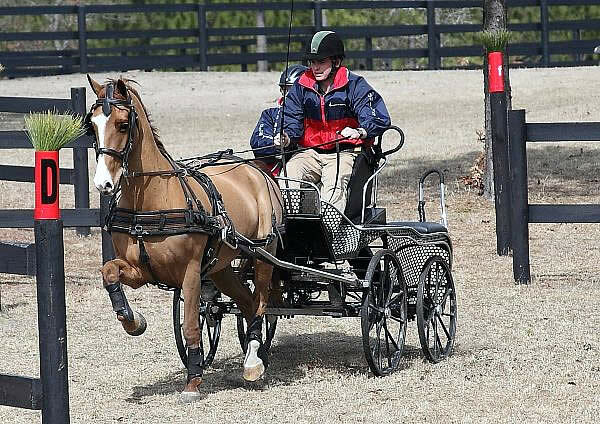 Salute to Driving will kick off its festivities on Friday, March 1, 2013, with dressage clinics by Michael Freund and Sterling Graburn at Chateau Log and Courage to Lead Farms. Auditing these clinics is free, and Freund will lead the USEF long listed drivers while Graburn teaches the developing drivers. Other special events include a hazard demonstration and clinic, harnessing demonstrations farrier demonstration, and a carriage exhibit. On Saturday, March 2, the clinics with Freund and Graburn will continue. The harnessing demonstrations and carriage exhibits will be ongoing, and a pleasure drive open to all will start during lunch. A Driving Blind Cones activity with golf carts will be held in the afternoon. Later in the evening, guests are invited to a fundraising dinner and live auction at Courage to Lead Farm. The affair will get underway at 6:30 p.m. with a catered dinner. Guests will have the opportunity to bid on fabulous items during the live auction conducted by Paul Martin of Martin Auctioneers. A sampling of the live auction items includes three nights (including breakfast) for two at the prestigious Union Club in the heart of Boston MA overlooking the Boston Commons, a visit to the famous Acadia National Park that includes stabling for two horses for two days, as well as accommodations at a nearby bed and breakfast for two nights for two, and a dinner for six presented by Jack Wetzel at his newly restored 1780s log cabin in Aiken, SC. In addition to this year’s live auction, a silent auction will be held throughout the weekend with a wide array of items on which to bid. Finally, on Sunday, March 3, the Salute to Driving weekend will wrap up with a thrilling Combined Test Competition open to all. Drivers at the preliminary through advanced levels will have the opportunity to showcase their skills in the areas of dressage and cones. During lunch, there will be a wonderful Very Small Equine (VSE) mini-Quadrille. Jennifer Matheson will conduct a “Dressage by the Side” Clinic, providing a commentary on what the judges are seeing and looking for within each test, which will continue through the afternoon and wrap up the day’s events. The Salute to Driving weekend will be the can’t-miss event of 2013. With a beautiful dinner, expert clinics, and an exciting competition, the Salute to Driving will surely be a weekend full of non-stop entertainment. For more information about the Salute to Driving event being held March 1-3, 2013 in Windsor, SC, please contact Beverley Lesher at 717-554-1241 or nanabrl@aol.com, or visit their new website at http://salutetodriving.com/.